Guinness in a cake? Yes, this Guinness chocolate cake is perfect for any celebration and has become a favourite choice for birthdays in our extended family around the world. The inspiration for this recipe is from one by Nigella Lawson. Instead of a white icing, there is now a luxurious chocolate ganache topping, along with options for gluten free, no added sugar, and long soaking of the cake mixture for easier digestion and even better flavour. I hope you enjoy this superb cake as much as we do! Preheat oven to 180°C without fan/350°F/gas 4; butter a round 23 cm diameter springform cake tin and line base with greaseproof paper. Grind sugar if using, to caster (fine) sugar 5 sec/speed 10, transfer to a bowl and set aside. Heat Guinness and remaining 250 g butter 3 min/80°C/speed 1. Add cocoa powder, flour, reserved ground sugar (or dates and honey), crème frâiche, eggs and vanilla, mix 20 sec/speed 6. Place soda bicarbonate in a small sieve and sprinkle soda over cake batter, using a spoon to press all the soda bicarbonate through the sieve. Mix 20 sec/speed 6, scrape down sides of TM bowl with spatula and repeat, then transfer to prepared cake tin and spread out evenly. Bake 45 minutes or until a skewer inserted in centre of cake comes out clean (Aga ovens: bake 1-1½ hours in middle of preheated baking oven). Allow cake to cool completely in cake tin on a wire rack. Heat cream, vanilla and chocolate 3 min/50°C/speed 3. Scrape down sides of TM bowl with spatula, add butter and mix 3 min/speed 3 or until ganache is completely melted and smooth. 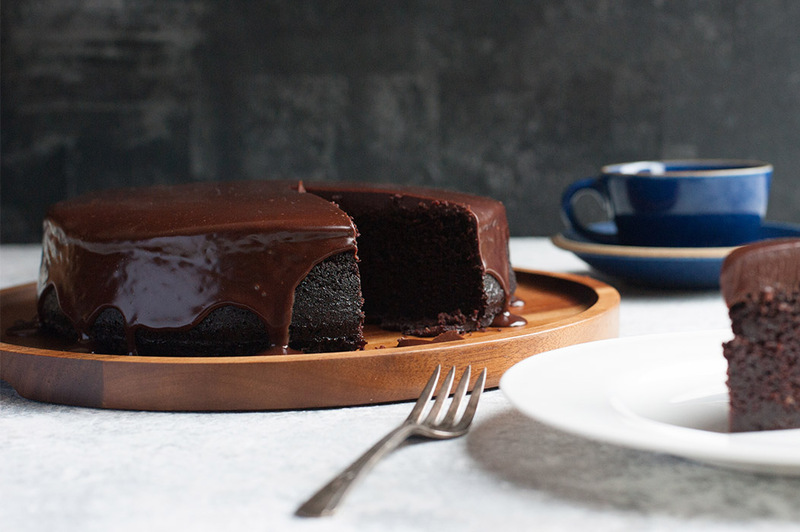 Transfer cake from tin to a serving plate, pour ganache onto cake and use a palette knife to smooth ganache over the edges so it drips down the sides. 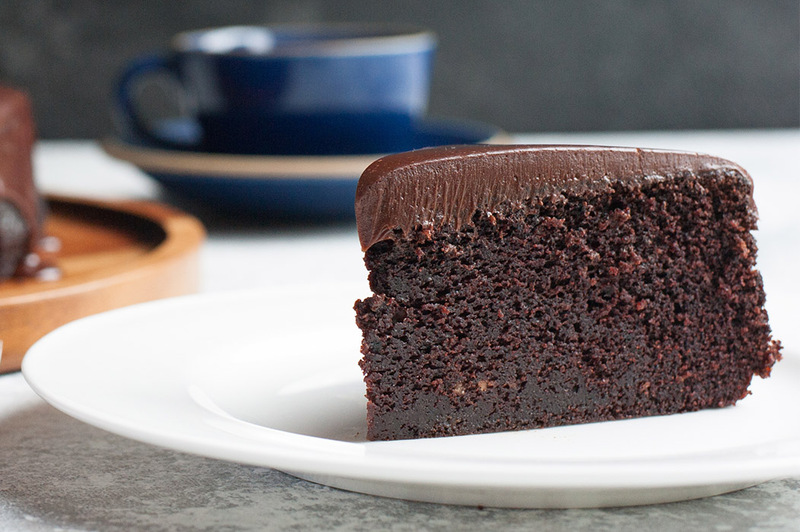 Serve within 3-4 hours while ganache is still soft enough to cut easily. For gluten free, use GF flour and GF beer. GF flour blends (which may be called GF baking flour) are available from most supermarkets and online. For improved digestion and great flavour you can soak the flour in the cake batter overnight (minimum 6 hours). At the end of step 4, cover TM bowl and allow the batter to soak and slightly ferment. It’s worth planning ahead – mix batter steps 1-4 in the evening or first thing in the morning, leave to soak, finish cake then serve for an indulgent afternoon tea with friends or as a glorious glossy dessert after dinner. 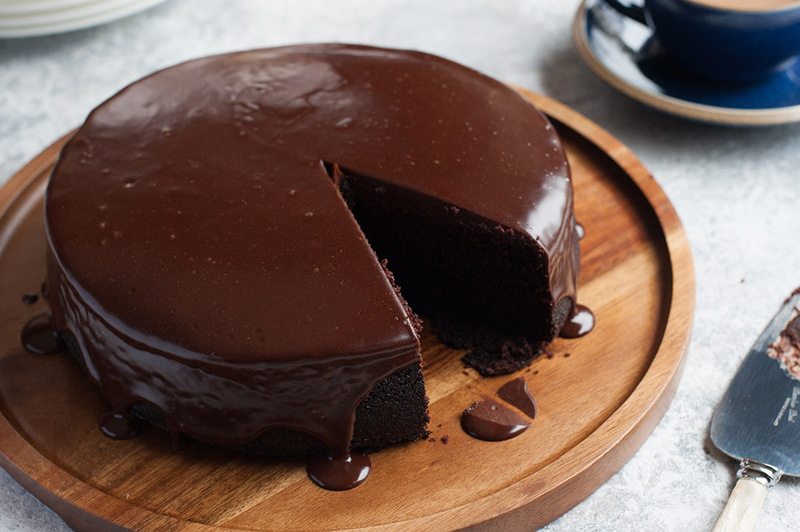 My sister-in-law bakes this cake in a 22×32 cm (9”x13”) cake tin and leaves it in the tin when adding the ganache, then she serves it straight from the tin! This is my all time favourite cake! I make it for every birthday!